Robersonville, NC – Thomas Burbage, who has been around East Carolina Motor Speedway most of his life, found himself in control of his own destiny Saturday night as he put on a racing clinic at the high-banked 3/8-mile speedway in Robersonville. Burbage was the fastest car in the late afternoon qualifying time trial session posting a quick lap of 15.150 seconds or 93.861 mph. Tyler Matthews, the 2016 North Carolina state champ took the green flag to his outside just six-thousandths of a second off the pole. Once it was time to get down and dirty Burbage hammered the throttle and cleared the field going into turn one. Matthews stuck on the outside had Louis White to deal with on his inside. Louis was able to get the position by the time the field came back around to complete the first lap. Wesley Johnson used the top groove to his advantage to get around previous East Carolina champion Jeff Shiflett. While all of that went on behind him Burbage had opened up over a full second lead over the field and did not appear to be looking back at all – slowly increasing his lead lap by lap. It took a couple laps for Matthews to get around White for the second position. Once he made the pass he set his sights on the #9 of Burbage – to his dismay, it did not look like anyone was going to be able to touch the nine car. In fact, Matthews had a huge check up going into turn three as they were working lap thirteen that allowed Louis White to make final pass for the second position. Other than Jeff Shiflett getting around the 12 of Wesley Johnson for the fourth position and a slip up from Kenneth Mercer that allowed Ryan Haddock to take the position, it was a rather calm race. Burbage was able to open up just over a three second lead over White. Louis did close the gap down to about a second and a half as the race came to an end but, it was an easy trip to victory lane for the Oak Ridge Metal’s machine of Thomas Burbage. Burbage is coming off a lackluster fourth place finish on opening night after showing speed during qualifying that night. This past Saturday, however, Burbage was not going to be denied from his pole and his win. 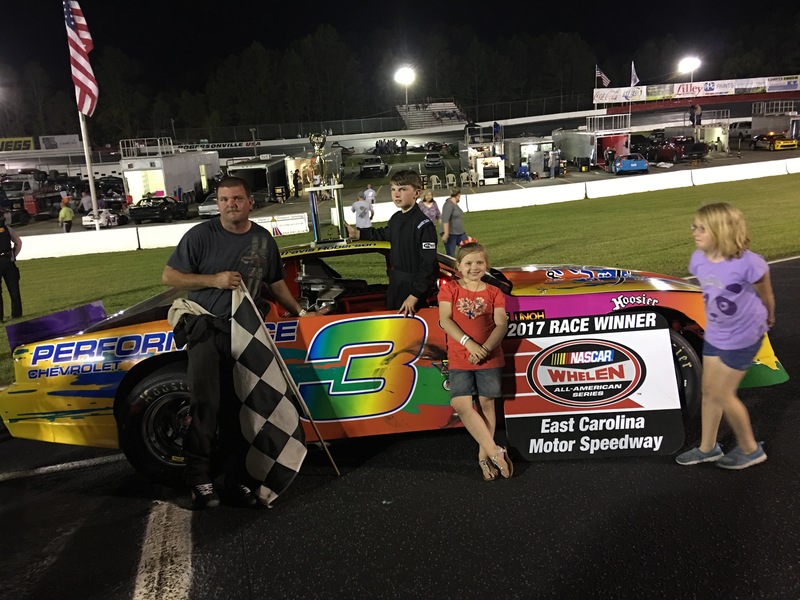 Travis Roberson found himself out front of one of the more interesting Street Stock races when the checkered flag flew at East Carolina Motor Speedway. Roberson, who was the second fastest of seven cars who showed up this weekend, jumped out to an early lead once the race finally got underway and never looked back. After five attempts to go green Roberson was clear of Mike Cooper by turn two and really turned the burners on. You would have thought the full moon was out down here in Robersonville after trying to get this one started from jumped stars to stalled cars and spins. It seemed that Jesse Council, who was subbing for Jamie Tucker in the #77 has the worst luck on the night after being involved in a couple of the cautions. Ultimately, Council’s night would be finished early after contact was made with Ed Lane who spun in turn four to bring out on of the evenings cautions. Once the field got settled down and the remaining cars strung out it was smooth sailing for Roberson in his Dale Earnhardt tribute Street Stock. Stretching his lead out to just over three seconds over eventual second place finisher Mike Cooper. We asked Travis about the start of the race and what the officials told him and Mike Cooper on the back stretch after one of the many green flag attempts. Late Models will be back in action at East Carolina Saturday, May 6th along with Street Stocks, UCARS, Bando’s, Trucks, Chargers and Bombers.